Protesters in Sydney, Australia, block streets in business district. Photo by Peter Boyle. 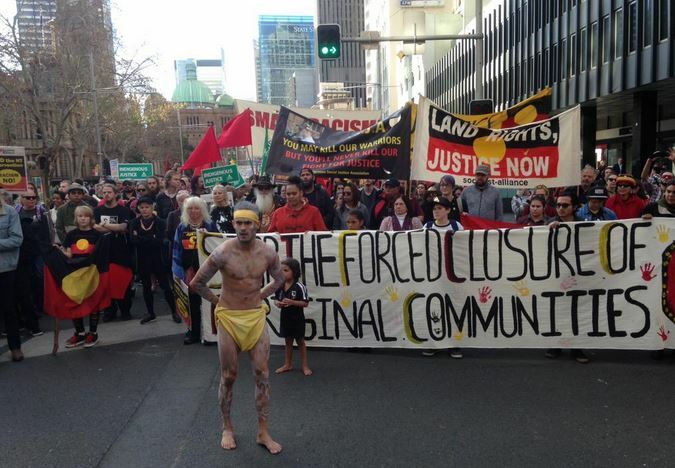 A protest against the closure of remote Aboriginal communities blocked streets in central Sydney on Sunday, as about 600 people marched against the Western Australian government’s plans to wind back support for communities it deems aren’t viable. The protest began at Town Hall at 1pm on Sunday and moved toward The Block in Redfern, closing George, Lee, Regent and Lawson Streets on the way. 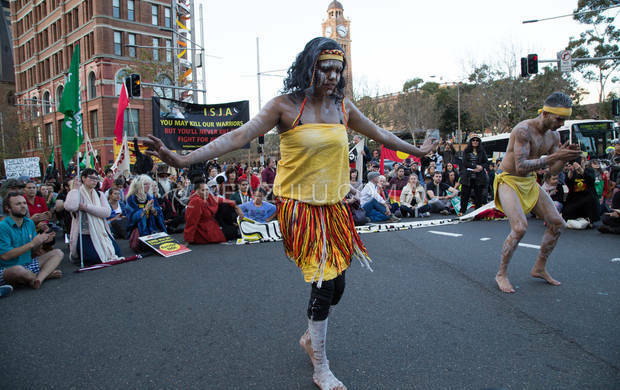 Aboriginal dancers perform during shut down of streets in Sydney’s business district, June 27, 2015. It’s the third national call to action and the sixth time protests have shut down an Australian capital city in protest against the plan to overhaul funding to the state’s 247 remote Aboriginal communities, which the premier, Colin Barnett, has said will result in “significantly fewer” homelands communities remaining open. Barnett raised the prospect of remote community closures in November, saying that up to 150 communities faced “closure” after the Abbott government shifted responsibility for municipal services funding on to the state. The funding shift will see direct federal funding cease from 1 July, but WA has been given an extra $90m – equivalent to three years funding under the old scheme. Police in “soft tac” riot gear monitor the protest. At the same time, WA has developed its own “major reforms” for service delivery in remote Aboriginal communities, which is expected to lead to the closure, through withholding services from some communities, of a number of less populated communities over the next few years. Details are scarce and the full model is yet to be worked out. Nominations for Aboriginal leaders to join the regional working groups intended to steer the reforms closed this month. Protest organisers, rallied around the #SOSBLAKAUSTRALIA hashtag on social media, have been ramping up activities since Friday ahead of July 1 – the day federal funding to WA’s remote communities formally switches over to the state. 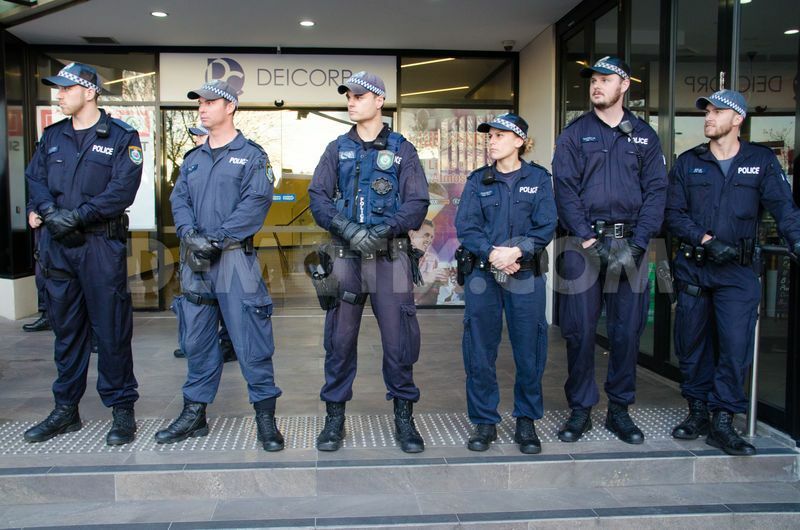 On Friday protesters shut down the Melbourne CBD for the third time, while protests also took place in Brisbane and Darwin. However WA’s Aboriginal affairs minister, Peter Collier, recently told a budget estimates committee that the federal funding loss – which only comes to about $30m a year, of the total of about $5bn spent on Aboriginal affairs – wasn’t enough to make a difference to the viability of communities “in isolation”. “That funding was simply minuscule in the big picture,” he said. Posted on June 30, 2015, in Uncategorized and tagged #sosblakaustralia, Aboriginal Australia, Australia community closures, native protests. Bookmark the permalink. 2 Comments.